Tustin (July 16, 2014) – WorldStage marked its tenth year providing the Milken Institute Global Conference with audio, video and lighting support as more than 3,500 movers and shakers challenged each other to find solutions and implement change for topics ranging from income inequality to a wide array of environmental issues. 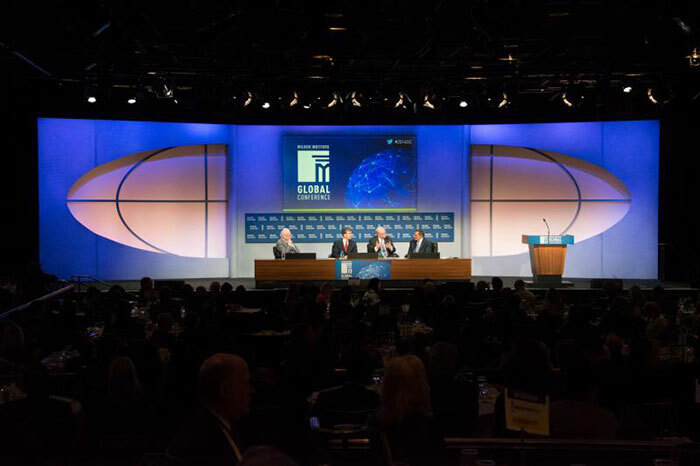 The 17th annual Milken Institute Global Conference brought executives, billionaires, philanthropists, scientists and celebrities to the Beverly Hilton Hotel for a gathering that has come to rival the World Economic Forum in Davos, Switzerland. More than 160 panels were grouped into 11 topic tracks; guest speaker included California Governor Jerry Brown, former UK Prime Minister Tony Blair, Dreamworks Animation CEO Jeffrey Katzenberg, and civil rights activist Jesse Jackson. As a testament to that, more than 130 WorldStage technicians were on site to ensure the success of the event during its four-day run, and a total of 33 HD cameras were supplied. To keep the tight schedule on track, the conference relies on a centralized IT structure provided by Vision Matrix that collects and distributes all the speaker support presentations directly from the speaker ready-room. “Typically, there was a moderator with a PowerPoint presentation and a panel discussion. All of the PowerPoint decks were collected in the speaker-ready room, and their content was pushed out to their respective rooms by the Vision Matrix IT team,” he explains. Along with the video support, WorldStage also furnished extensive audio and lighting facilities that included a large complement of audio speakers, wired and wireless mics, digital audio consoles and intercom systems, as well as a package of conventional and LED lighting for 11 rooms. Additional lighting was provided for music and comedy performances by Babyface, David Foster and Chris Tucker in the Beverly Hills Room. “The logistics of the Milken Global Conference are pretty staggering, but after 10 years we’ve definitely found our rhythm!” says Bevan. At WorldStage Sean Glenn, Gary Kajikawa, Lonnie Hamilton, Dave Morris and Tom Mathis were the project managers; James Sarro equipment manager; Nicole Walter labor coordinator; Robin Gray lighting designer; and Heidi McGuire director in the Stardust Room.